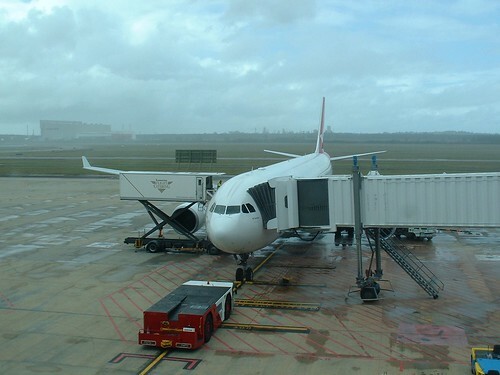 Left Australia in the morning on a Qantas Airbus A330 with excellent seats. Most people wouldn’t care for seats directly behind the toilets but we weren’t in the smelling range and the leg room was incredible. We could put our feet up against the wall and the tv was on an arm in the seats so you looked down at the screen. Qantas now have on-demand entertainment so you can pick and choose the movie you want and rewind it, pause and fast forward. That being said, I picked Mission Impossible III, Jindabyne and to get over the heaviness of that movie – RV with Robin Williams. Mission Impossible III doesn’t quite work on the small screen, Jindabyne was good if a bit slow and surprisingly RV was a little bit funny. I wouldn’t have paid for any of them though. Lunch involved me spilling vinigerette all over my shirt and jeans which is always great when you only have one pair of jeans for your trip and you are wearing them. Thankfully the shirt took the brunt of it along with the qantas blanket. Unfortunately the shirt was my limited edition Woz Brick shirt – hopefully it’s not wrecked. To compound my woes I managed to bump in to the stewardess while she was picking up food and I was trying to get to my chair, then 5 seconds later when I tried again. First time was an accident, the second time was stupidity as you don’t want to piss off the hosties as they can make or break your trip. Thankfully she was forgiving about it but she probably bitched about it later. Emerging from the plane after 8 hours travel we were suprisingly still fresh. Customs wasn’t a hassle and neither was picking up the bags. We were in Hall A but had to walk to Hall B to find our way to the bus. Our mission was to find a guy in a green jacket which turned out to be easy. He stuck a few stickers on us, gave me a return envelope and told us to head on down to the bus which would be about 30 mins. We went downstairs, alerted the guy to our existance, sat down and Pauline said she was off to the toilet. Seconds after she disappeared from view the guy announced the bus for the Marco Polo hotels was ready. I of course freak out, tell the guy my friend has gone to the loo, he puts our luggage in the bus, I tell some people that Pauline picked a good time to go to the loo then head off to tell her to hurry up. We head back, get on the bus, all the while hoping that our luggage is travelling with us. The time was about 6.30pm when we left the airport but the sun was still out so we got to see the view. Our first impression of Hong Kong was lots of highrises side by side that all looked the same. We got to go over one of the biggest suspension bridges in the world and I realised that the New Territories were way more populated than I imagined thanks to more highrises that we could see from the highway. Traffic was non existant for most of the trip until we reached Kowloon where it turned manic. People merging left right and centre, a golfing range in the middle of the city and lots of mercedes benzes. 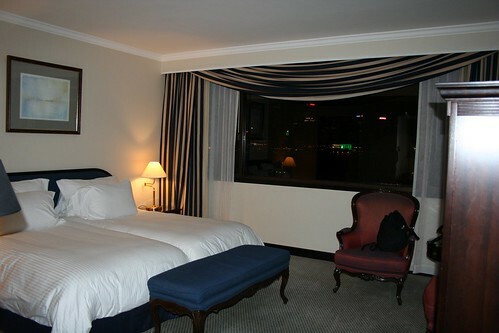 The bus let us of at the hotel, we checked in, they took our luggage and we headed up to the ninth floor. Walking in to the room we were blown away by the view of nightime Hong Kong which was in the middle of it’s symphony of lights display. The room was huge, there was a bath and even a pantry. We were cheapskates by not giving the guy who brought up our bags a tip but we didn’t have any small change at the time and I can’t stand the idea of tips. Didn’t stop us from feeling guilty though. Hunger forced us out in to the Harbour City shopping centre that was on the third floor of our building. It’s the biggest shopping mall in Asia thanks to it’s length which spans three hotels side by side. It’s only three stories but even I got lost in there. 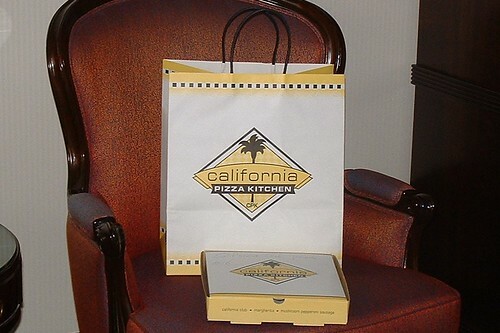 We ended up getting takeway pizza from the California Pizza Kitchen and taking it back to our room. We got the California Club Pizza which was quite frankly the best pizza I’ve ever had in my life. Who’d have thought that avocado and lettuce would go on pizza with bacon and potato. I had to put it together back in the room because they don’t actually cook the lettuce in the oven. 🙂 Even their takeaway bag was all style – like we’d bought the pizza from prada or something. After dinner we headed down towards the Star Ferry terminal where the heat hit us for the first time. We were accosted by Indians plying us with offers of lady tailors but ignored them. I thought there would be more tour companies in residence at the terminal but there wasn’t really anything. 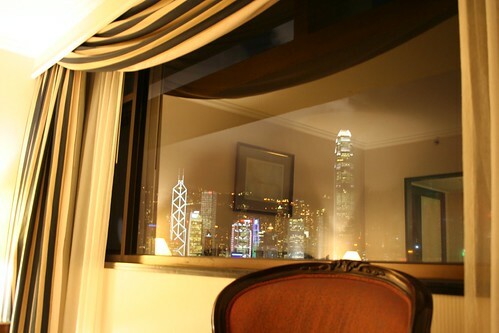 The heat drove us back inside for our first night sleep in Hong Kong. In the five hours or so we’d been there we’d seen most sides of the city. The architecture, the heat, the shopping, the annoying indians and the excellent service.